There’s a regal quality and sophistication to the MSpa Luxury Exotic 6 Person Jet Spa which we love. With its elegant black and gold satin exterior design, and its internal cushioned seating, right through to the powerful, adjustable hydromassage jets, you’re really going to enjoy this luxurious top-of-the-range model. It’s also one of the biggest inflatable hot tubs you can buy, measuring 80 inches across and 28 inches deep. This makes it big enough for 4 adults to stretch out in comfort. You can also seat 6 adults if you wish, and they will all get a fantastic soak in the hot bubbling waters. 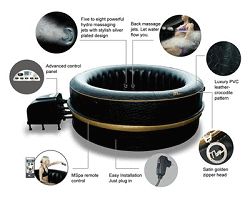 The massage system is super-luxurious as well, unlike the ones you usually get in an inflatable hot tub. It’s provided by 8 adjustable and very strong air jets, just like you get in a traditional rigid hot tub. This feature alone make this portable spa stand head and shoulders above other portable hot tubs. All this sophisticated design and the top-of-the-range features comes at a price. But if you have a look on Amazon, they usually have some great deals, but these tend to go fast so it’s worth checking them out soon. To see the latest deal you can click on this link. To help you decide if this is the spa for you, we have put together this table to show you all the features and specification of the hot tub, as well as comparing it to other top-of-the range models. We hope it helps you! The MSpa Luxury Exotic 6 Person Jet Spa is a round hot tub, measuring 80 inches across and 28 inches deep. It really is a very large spa, and holds 320 gallons, which means that it weighs 2,781 lbs when full. That’s as heavy as a small car! So if you’re thinking of putting it on a deck, make sure your deck can take that kind of weight. Plus, you’ll need to remember to add on the weight of the people who use the hot tub. If you are thinking of putting your hot tub on a deck, or even in a special hot tub room, then you do need to think about loading bearing capacity. There’s an excellent article over on the decksgo website which makes a good starting point to help you. The MSpa Luxury Exotic Spa has six internal seats on the hot tub floor. The MSpa Luxury Exotic is made of 6 layers of reinforced PVC, and it has an internal I-Beam construction which gives it extra strength and support. This means the hot tub is super-sturdy and capable of withstanding year-round use. If you do plan on using your hot tub outside in the winter, and you live in an area where the winters are particularly cold, you will need to take some simple precautions to keep the hot tub running. We have written an article on inflatable hot tubs for winter, which you can read by clicking here. Even though the hot tub is super-strong, it is still extremely comfortable to use and of course extremely easy on the eye. 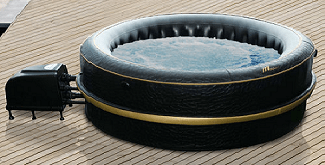 In fact, one of the first things we noticed about this portable spa is the crocodile pattern leatherette skin with its satin golden trim, which adds a sophisticated look and feel to this hot tub. The interior of the spa is also cool black, and it has 6 internal cushion seats on the cushioned floor. Add on the striking control box, and the black inflatable cover, which zips all the way round and locks digitally, and we were struck by the elegance of this superb hot tub. The massage system you get with the MSpa Luxury Exotic 6 Person Jet Spa is fantastic. It might seem strange at first to find that you get 8 massage jets, compared with the 130 bubble air jets you get with other top-end models. That’s because these 8 hydro massage jets are like the ones you get in a traditional rigid hot tub. They are chrome plated, incredibly powerful, and can be swiveled into any position. This makes the MSpa Luxury Exotic 6 Person Jet Spa ideal for hydrotherapy, as you can direct the jets to specific parts of your body. There is also a dial on the hot tub that gives you full control over the strength of the water jets as well. If you want see just how powerful the massage system is with this spa, check out our video at the bottom of the page. Check out our video at the bottom of the page which gives full instructions on how to set up the MSpa Luxury Exotic 6 Person Jet Spa. Even though it is such a sophisticated high-end model, the MSpa Luxury Exotic 6 Person Jet Spa is still easy to set up. You need to choose a flat site to house your hot tub, free from sharp objects. Because the hot tub is almost 7 feet in diameter, you need to make sure you have enough space to site it. As well as the hot tub itself, you’ll need an extra couple of feet all around for access, as well as making sure you can fit in the control box, which sits outside the spa. So you’re looking at an area that is at least 11 to 12 feet square. When you have your site worked out, lay out the 9 squares of the foam insulated ground blanket where you want to put the hot tub and connect them together, like a simple jigsaw. Then spread out the hot tub on top. Fully undo the air valve which is concealed under a small flap in the side of the hot tub. Connect the inflator hose to this air valve and then to the automatic inflator, and inflate the hot tub. This takes only a few minutes. Remove the inflator hose from the air valve on the hot tub, and use the manometer to check the hot tub is fully inflated. Make sure you don’t over-inflate the hot tub, as this can lead to leakage when the hot tub is filled with water. Next, you need to connect the control box to the hot tub. Once the control box is fitted, it is time to fill the hot tub with water, using an every day garden hose. We recommend that the first time you use the hot tub, you fill the water to the minimum water line rather than the maximum. This will allow you to see how much the water rises when you get in an also how much it rises when you turn on the massage system. You can then add more water once you get used to your new tub. When the hot tub is filled, inflate the inflatable lid and put it on top of the hot tub. Then place the cover on top and zip it up. You are now ready to heat up the water. Using the remote control, set the temperature you want the water to heat to, up to a maximum of 104F. It will take about 24 hours for the water to reach this temperature. So if you can’t wait that long, we always suggest filling your inflatable hot tub with hot water from your faucet, to speed things along. When the water is at your desired temperature, as shown on the digital panel, take off the cover and the lid, and slip into the hot tub. You can position the hydro jets to give a full body massage, or direct them at certain parts of your body for an intense massage. You can also change the power of the hydro jets by turning the knob on the side of the hot tub. Once you are in the hot tub, the waterproof remote control unit gives you full control over everything you need, including the massage system and the water heater. As with any hot tub, both portable and rigid, using the massage jets does cool the water temperature a little. So you may wish to turn the heater on with the massage system, or turn it on to reheat the water when you’ve finished. Remember to replace the lid and the cover every time you get out of the hot tub. This also prevents children getting into the spa when they are unattended. Who Should Buy The MSpa Luxury Exotic 6 Person Jet Spa? 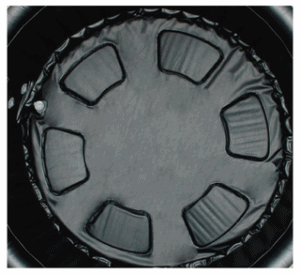 This is such an excellent inflatable hot tub, one that we think is a real game changer. We love its sophisticated design; and when you get in, you do feel you are sitting in a luxury spa. We are also blown-away by the hydro jets. They really are like the ones you get in a rigid hot tub. Overall, this is a super spa, and one well worth considering. We know the MSpa Luxury Exotic 6 Person Jet Spa does require a serious outlay, but if you’re looking for a luxury model, then we feel it’s worth every penny. As we mentioned before, the best deals are usually on Amazon.com, including regular deals with free shipping. With such a heavy item, a deal like this is well-worth checking out, which you can do by following this link. Thanks for reading. Tagged inflatable hot tub review, MSpa inflatable hot tubs, MSPA Luxury Exotic 6 Person Jet Spa Review, portable hot tubs.